Day 1 – a group of tourists take a selfie on the beach while the dolphin boat heads out. 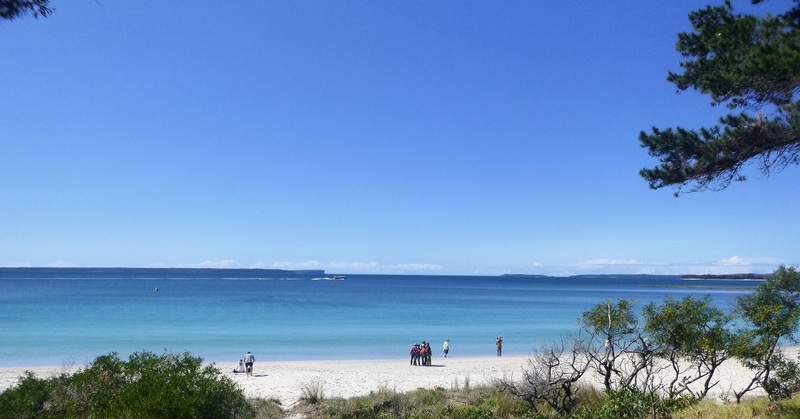 I have lived near Jervis Bay for over 10 years now. 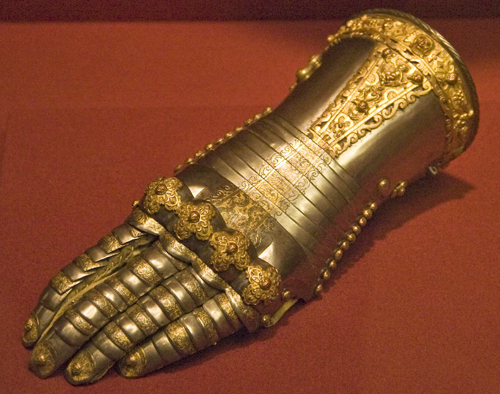 You would expect that the stunning effect would eventually wear off. I’m here to tell you, it does not. There are days when the beauty stops me in my tracks and I cannot help but stare. Day 2 – swimmers are surprised by a pod of dolphins on their way to meet the Dolphin Boat. There are days when I reach my “goal” of however many KM that I set myself, and decide to just keep going instead. However the past 2 days I have not been able to get to the bay due to a long weekend and I knew this would happen so I made sure to add on an extra 5km to my 10km walk on Friday. Traffic was bad on Friday. I got stuck at one notorious intersection for over 20 minutes. 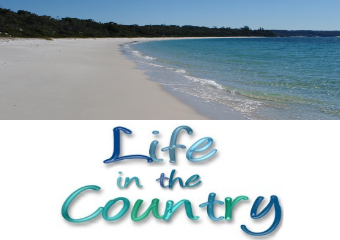 Long weekends are great times to do a lot of work at home when you live in a holiday destination but you have to plan ahead, make sure you have everything you need well before the weekend, and choose your moments – and places – if you do need to get out and get something as a surprise. Between 5-8pm on Saturday and Sunday are generally good times to go places as long as you are not wanting to eat out in a restaurant. 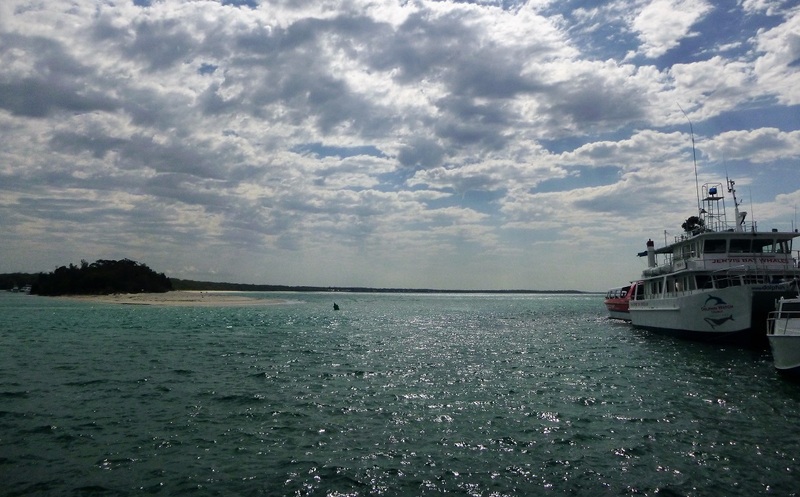 Day 3 – The dolphin boats await their passengers. I have been trying to get to the walking tracks at least 6 out of 7 days for the past 3 weeks. The weather has been excellent. I would actually prefer it to rain because we really need it. If it did rain, I would still go for my walk. Thunderstorms and lightning, not so much. 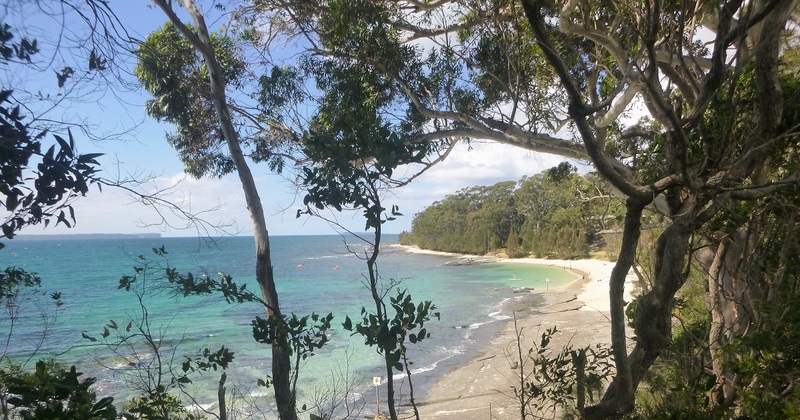 Day 4 – Kayakers head out into the bay. Lately my photos have not been doing any justice to what I am seeing with my eyes. It might be time to replace this camera. Here you see 7 photos from my most recent 7 days at the bay. Most of the photos should enlarge if clicked on, except for day 6. Day 5 – Rays of sunlight break through the clouds. It is school holidays here. I don’t mind the extra people about. It is so lovely to see more people enjoying the bay. Everyone I pass says hello. I do mind them being endlessly inconsiderate of others walking the path – and alternately being completely unaware of anyone around them which means I tend to scare them when I walk or run past them – littering – and somewhat memorably last week someone set fire to the toilet paper in our public toilets. 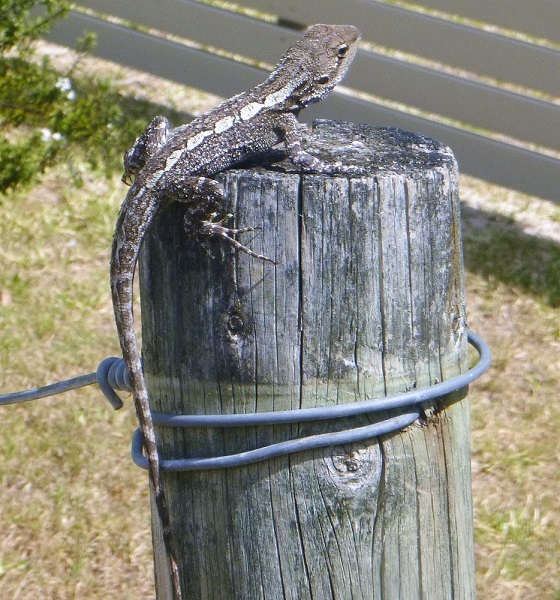 Day 6 – I made a lizard friend. I do think sometimes I could use a bike bell to let people know I am approaching, but I wonder exactly where I would put it. Both my wrists are spoken for – one with my fitness watch, the other with my camera cord. Maybe I should wear a bell around my neck, like a cat or dog. 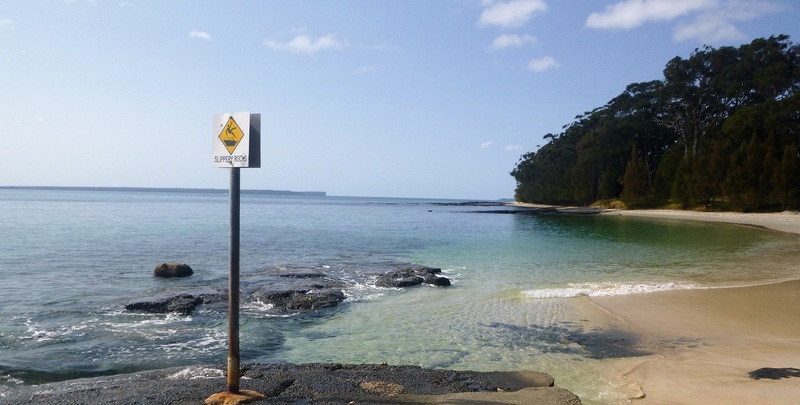 Day 7 – Shark Net beach is usually very calm, perfect for swimming. I also do mind when they cannot allow the beauty of the bay to distract them from their problems and issues. I overhear things. Who cares about work, you are not there right now, you are here in the bay, enjoy it! Sure, none of the overheard things are “No Mummy, PLEASE, NOT the mineral water, Mummy!” which was our most remembered overheard snippet of conversation ever, in a supermarket in Adelaide and we have been laughing about that ever since. We have no idea what Mummy does with the mineral water but we have imagined many things. More than likely the child wanted Coca Cola instead. What is your most remembered overheard snippet of conversation? 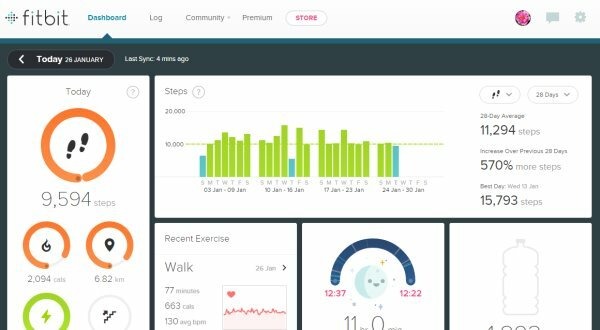 Recently Fitbit did an update and added a new box to the dashboard. 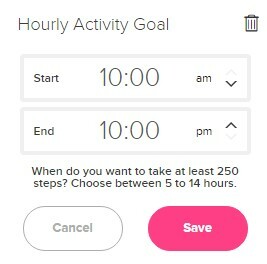 The concept of this box is to try and get 250 steps an hour. I thought this was a great goal for me! You can customise this to suit yourself, as well. 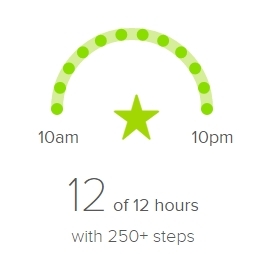 I especially like it at night time as a reminder to get up and move because once I have done my exercise for the day and made dinner I can often “forget” to do anything more. 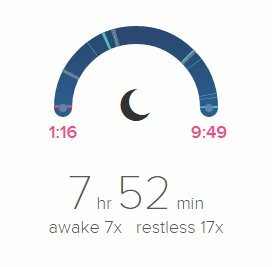 I customised mine to involve 12 hours a day, and I set alarms for 45 minutes past the hour. When that alarm goes off, I get up! 250 steps is around 200 metres on my treadmill. This takes me about 2-3 minutes. Another fitness week! This is more for my own records and to put all of this together in one place, so you can feel free to just skip past this post. 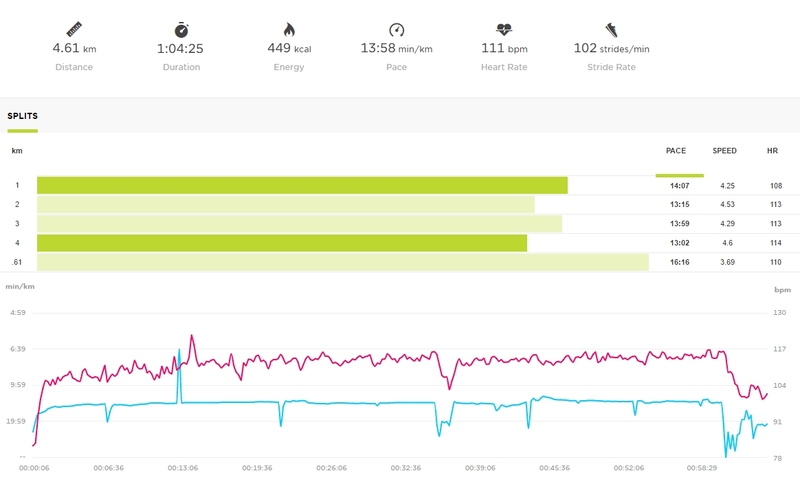 Todays workout was in two parts and was different to the normal. I did 1k treadmill, 10 mins elliptical, 1k treadmill, 10 mins elliptical, then 1k treadmill. There were also some floor exercises for abs. YAY. Above is part 1. This is my personal best for a 1km since getting back into exercising. 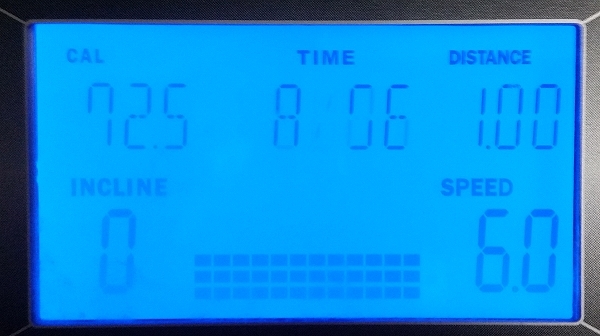 8:06 – sorry my treadmill quite uncooperative, with the photography! Above you see todays first km..
And here is part 2. 552 calories burned total. 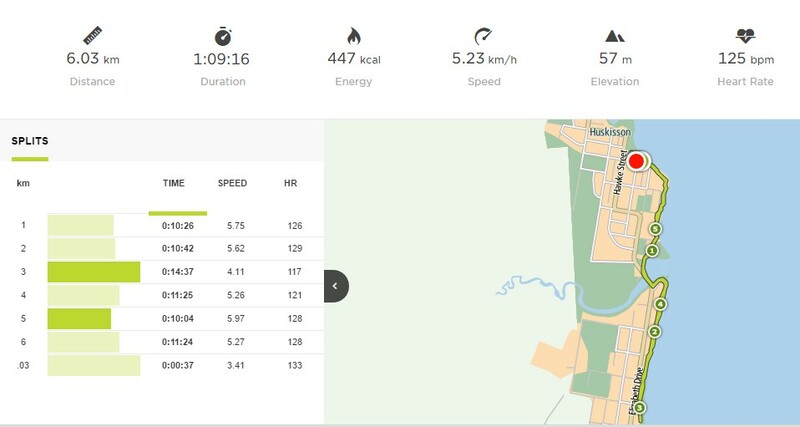 Todays 6.5km walk brought to you by the Volkswagen Polo, plus Psycho Killer by Talking Heads which was the last song that played in the car before we got out, and thus, played in my head the entire 77 or so minutes. Plus, I took a couple of pics, for you. Cloudy day, warm-ish, excellent for walking. YAY CLOUDS! Todays workout brought to you by The Village People, specifically U can’t stop the music – Queen, specifically Don’t stop me now – plus my chicken Rosie who decided this music meant she should make a run for it into an offlimits area! This was a super tough workout involving circuits between the elliptical and the treadmill. Todays “rest day” slow walk brought to you by episodes 18 and 19 of The Good Wife which I am hate watching now, and Skye from Tinykittens, I am watching and waiting for her kittens to arrive. I got on again for another 16 minutes later, just to get some extra steps in and watch the last of episode 19. I don’t know why my iPhone hates me. Every time I think I will walk a little slower, it plays yet another tune of awesomeness that makes me speed up or even run. And today it made me have a personal best ever time! 7.45 for the first 1k, and then this great time for the 5k. Todays workout brought to you by new water shoes! Yay 713 calories burned total. I’m showing you a different screen today. Another highly active week. Weigh in at the end of this week was 83.2. Tomorrow is already tomorrow, in Australia! 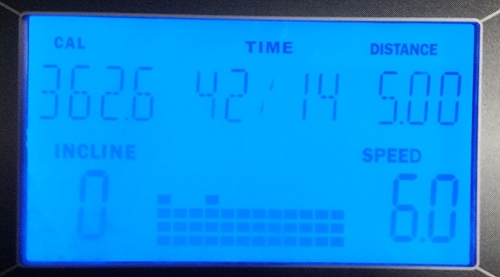 Todays 5km on the treadmill. I will usually take a shot of the treadmill, or a screenshot of the Cardio Spark stuff from the pool, but I had done this before I knew about the challenge. 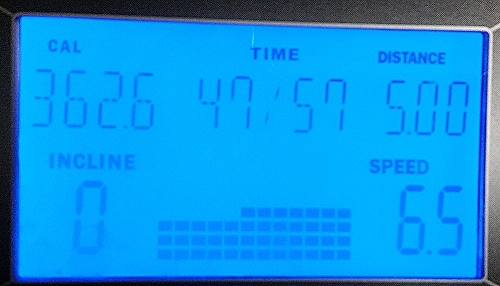 Time was 52:54 – the extra time is water breaks while I pause the treadmill. I can’t drink and walk, lol. 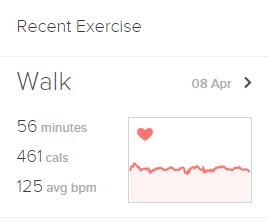 Todays walk was an interpretative dance set to episode 11 of Billions. Here is my today walk. This is the first time we’ve been out to walk at Husky/Vincentia since February or so, was so nice! I SEEN dolphins, a beach mouse, beach birds, cyclists, children eating cheesecake, and a skateboarder gondolier! Todays workout brought to you by Wahlburgers, TICDA and Sephyroth sending me a message that said “6k 59:55” plus, too legit to quit. Todays workout brought to you by – ep12 of Billions which is a show you should be watching if you are not already – Nutri Ninja which made a most awesome post workout shake YAY – and you all here, who make me want to push myself and documentation accordingly! Todays workout brought to you by – Deadliest Catch s12ep3 – Neelix over at Tinykittens who birthed some kittens today yay! – and the letter E, for exhausted. I really pushed – possibly slightly too far today. Tomorrow – Aqua Aerobics and I plan to burn 600 calories in the pool to allow for a slightly calorific dinner tomorrow. Above you see the Cardio Spark track for Aqua Aerobics. Above you see the Cardio Spark track for Aqua jogging. 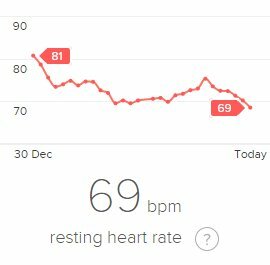 What I was doing was, running up and back the pool (50M total length of running) to get my heart rate up to 160 or so, then walking to cool it back down, then running again, etc. 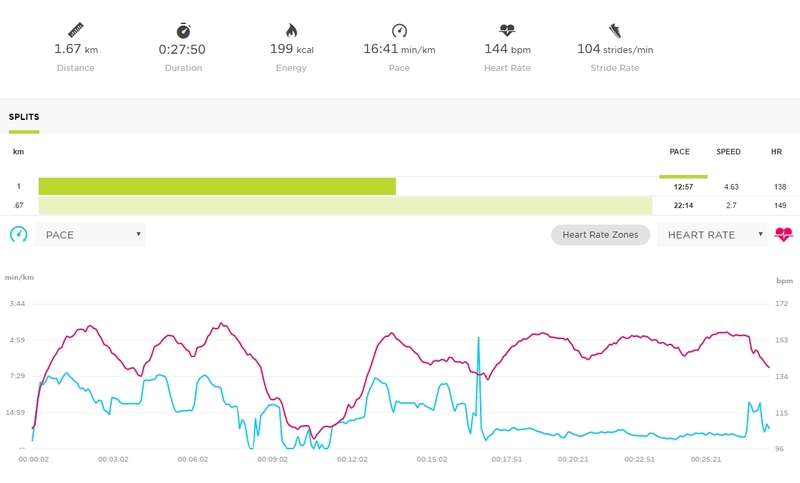 Above you see the Cardio Spark tracks once Fitbit pulls them into itself. There was also a warmup while I waited for Aqua class to start, I burned 50 calories there, YAY. 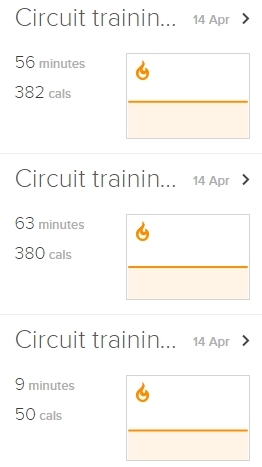 Todays work out brought to you by swimming through a flabby armed spanking machine AKA Aqua Aerobics, school holidays where the kids have forgotten the pool exists THANK YOU JEEBUS, and Honey and Mustard Chicken which I wanted to make sure I had burned those calories before I even cook it, lol. 812 calories burned! At the end of the week, we got a Fitbit Aria scale, and it gave me a number I had not seen thus far. 84kg. That is 11.2 lost since 1 January. Happy moments!